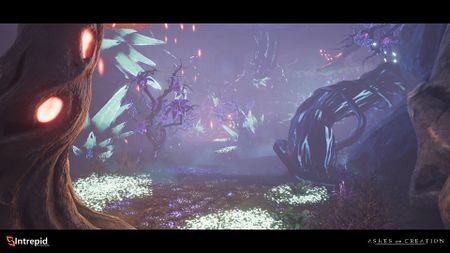 There are different parts to the Lore in Ashes of Creation. The story of the fall. These story arcs drive one or more quest lines. Ashes of Creation offers nine playable races. Aela Humans (Kaelar and Vaelune). Pyrian Elves (Empyrean and Py'Rai). Kaivek Orcs (Ren'Kai and Vek). Dünzenkell Dwarves (Dünir and Niküa). Aela Humans are split into two races: Kaelar and Vaelune. 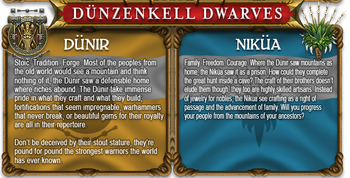 Dünzenkell Dwarves are split into two races: Dünir and Niküa. During the great calamity that befell Verra, the inhabitants of Dünheim elected to remain in their mountain keep. This didn't work out well for them. In the wake of the destruction many artifacts and treasures were left behind. Kaivek Orcs are split into two races: Ren'Kai and Vek. 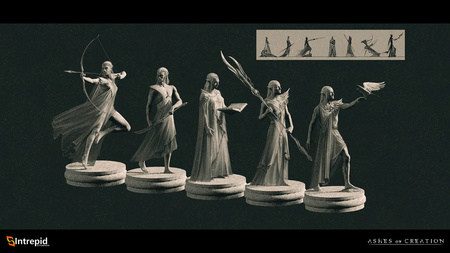 Pyrian statue concept art by Ryan Richmond. Pyrian Elves are split into two races: Empyrean and Py'Rai. 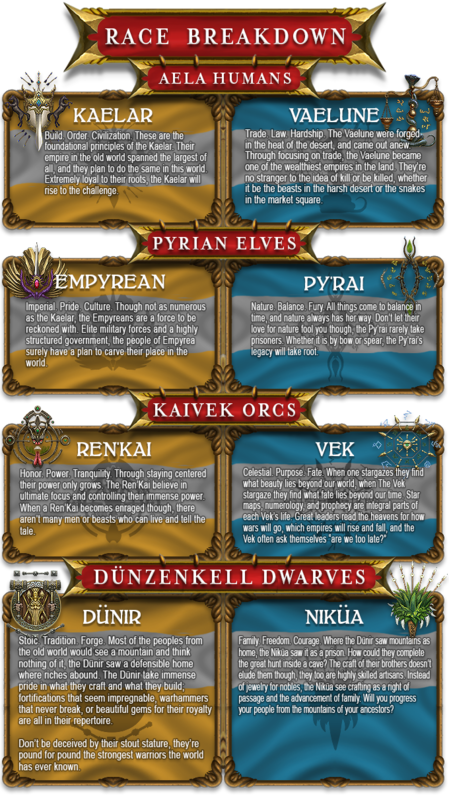 Pyrian are the parent Elven race from long ago: The ancient elves. 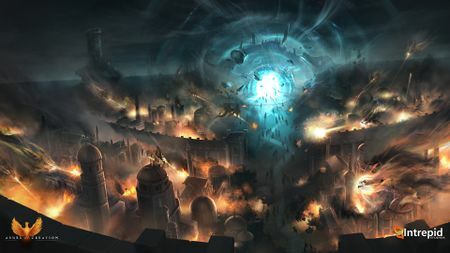 Concept art showing the citizens of Verra escaping a besieged city through a divine gateway. Long ago, the world of Verra was besieged by a great calamity. A corruption befell the land, twisting and perverting every facet of nature, spawning hideous beings of every description; from troll-like creatures to towering behemoths. Nothing escaped its touch. 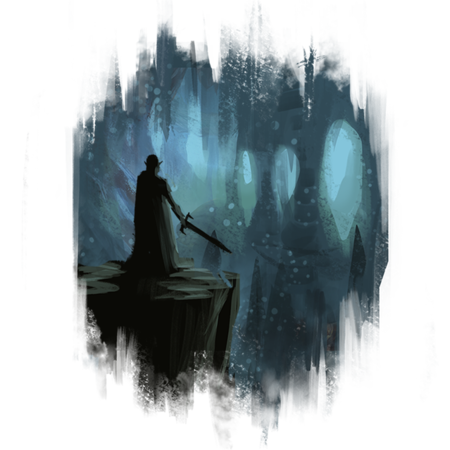 Granted by divine intervention, much of the population fled Verra through towering gateways, seeking refuge in a world void of magic. The world of Sanctus. Some unlucky citizens didn't make it through the gateways in time and fell back to the planet to fight for survival. Soon after the exodus, the gateways dimmed and became dormant. Centuries turned to millennia, burying them beneath myriad calamities. Over eons, history became legend, then even the great legends were at last forgotten. The Tulnar evolved as a combination of the four parent races that were left behind on Verra. The world in Ashes has been void of civilization for centuries. The world in Ashes lay devoid of civilization for centuries. Until now. Sanctus is the world where the people of Verra found their sanctuary. 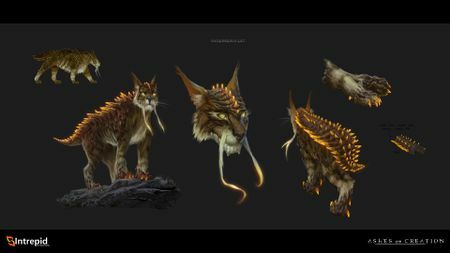 Tulnar is a playable race in Ashes of Creation. The Tulnar fled to the Underrealm to escape the Corruption that befell Verra. The Tulnar is a combination of four different races that were left behind on Verra. This was previously stated to be three different races. Tulnar stands for "the forgotten". Tulnar are not restricted to the Underrealm (there are no factions). The Underrealm is a rich environment where bio-luminescence abounds in the fauna and flora that exist here. These deep caverns and underground valleys provide new destinations for civilization to develop. 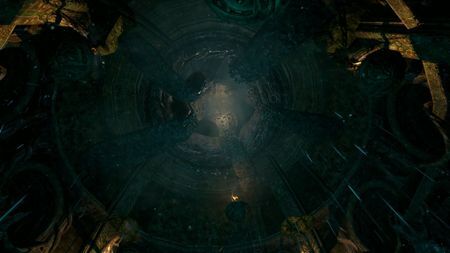 Bringing the node system into the depths of the world may awaken darker creatures than the surface. Adventurers arrive on Verra through great divine gateways. What was once buried has risen again. The gateways have opened, reigniting the link to the ancient world. 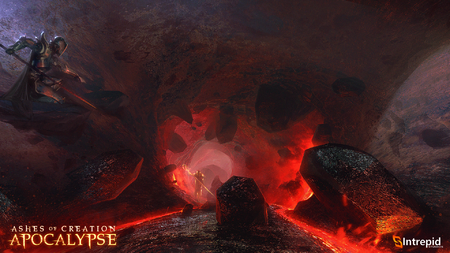 Vast expeditions were sent through the gateways to discover this beautiful and perilous magical realm. Ancient evils lie in wait for hapless adventurers. 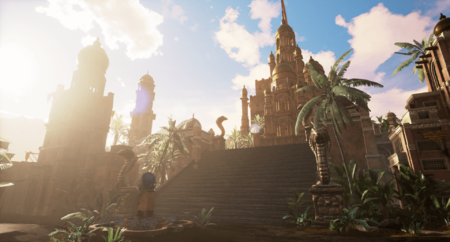 Players arrive in Verra to explore, rebuild and repopulate their place of origin. Ancient treasures and wondrous adventures await those who dare to disturb the dark remnants of evil that inhabit this land. From now on, the choices of these adventurers will influence how the story unfolds. 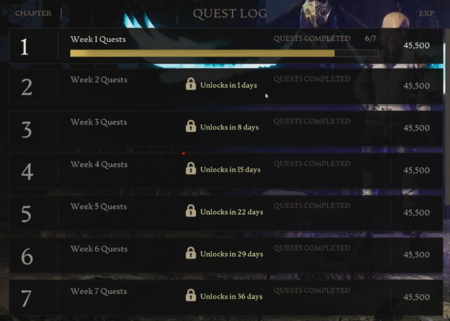 Storyline quests can have multiple stages. These quest stages can actually be failed. The ability to retry a failed quest depends on Node progression. 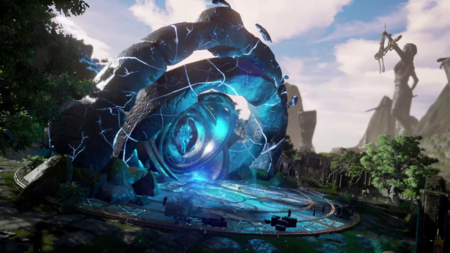 Story arcs drive one or more quest lines in Ashes of Creation. Certain story arcs can be unlocked through the bulletin board system. Certain requirements would need to be met in order to access story arc quests. Buildings are required within a node. Social organization tasks need to be completed. Quests may be based on a character's race. Different quests may relate to who the primary cultural contributor is to a node. 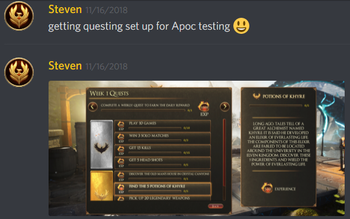 This won't lock out content, but will add flavor to the quests. 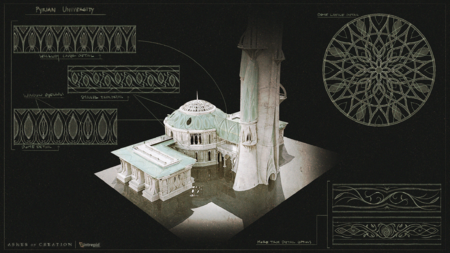 Pyrian University building main hall/study area concept art. 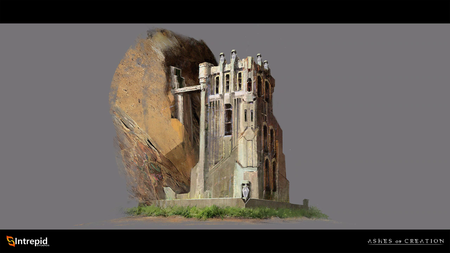 Pyrian University building concept art. 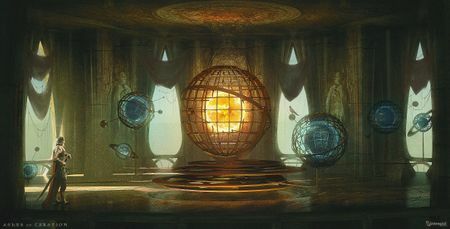 A university is a type of building in Ashes of Creation that unlocks at Stage 5 (city) of a Scientific node. Scribes are members of a potential crafting profession in Ashes of Creation. Scribes can create scrolls or books. They want to be able to collect information about the events of the world as they see it from their point of view. For instance: Nodes leveling up, they want to be able to take that information down and be the one to distribute it. Ashes of Creation concept art. 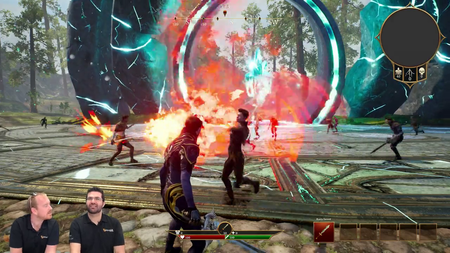 There are different systems that allow stories to be told in Ashes of Creation. Easter eggs out in the world. 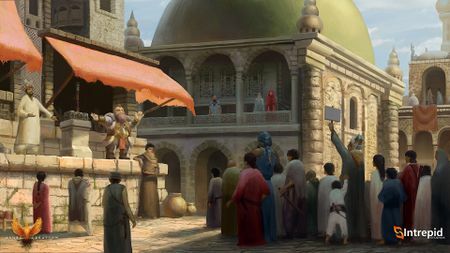 Social buildings provide spaces for players to gather and tell/share stories, while also affecting the game and interacting with the world. The node government system builds into this. Players can run a business based on role playing. There is a storyline that relates to how and why characters respawn and the locations in which they respawn. This will be revealed as players explore the game. ↑ Ashes of Creation Press Kit. ↑ Interview, 7 December 2016. ↑ 3.0 3.1 3.2 Livestream, 18 January 2018 (39:08). ↑ Video, 5 April 2018 (37:50). ↑ Video, 5 April 2018 (37:13). ↑ Livestream, 26 May 2017 (10:58). ↑ 9.0 9.1 9.2 9.3 9.4 Livestream, 26 May 2017 (15:37). ↑ 11.0 11.1 11.2 11.3 Livestream, 8 April 2018 (AM) (10:02). ↑ 12.0 12.1 12.2 Interview, 31 October 2018 (6:00). ↑ 13.0 13.1 Livestream, 3 November 2018 (0:01:18). ↑ 14.0 14.1 14.2 14.3 Livestream, 3 November 2018 (0:00:20). ↑ 15.0 15.1 15.2 Livestream, 3 November 2018 (0:06:56). ↑ 18.0 18.1 18.2 18.3 18.4 Ashes of Creation race breakdown. ↑ 19.0 19.1 19.2 19.3 Kickstarter $2,500,000 New Player Race Achieved. ↑ Livestream, 3 November 2018 (0:00:54). ↑ Livestream, 3 November 2018 (0:01:57). ↑ Livestream, 3 November 2018 (0:02:35). ↑ Livestream, 3 November 2018 (0:05:24). ↑ Livestream, 3 November 2018 (0:00:28). ↑ Livestream, 3 November 2018 (0:01:29). ↑ Livestream, 9 February 2018 (13:47). ↑ Livestream, 18 January 2018 (21:18). ↑ Livestream, 3 November 2018 (0:02:36). ↑ Livestream, 4 May 2018 (34:30). ↑ Livestream, 3 November 2018 (0:00:10). ↑ 39.0 39.1 39.2 39.3 39.4 39.5 39.6 39.7 Unreal Engine Interview, 23 May 2017. ↑ 40.0 40.1 40.2 Ashes of Creation - A world with consequences. ↑ 41.0 41.1 Interview, 20 April 2018 (5:46). ↑ 42.0 42.1 42.2 42.3 42.4 Livestream, 27 September 2018 (6:22). ↑ 43.0 43.1 Livestream, 8 April 2018 (23:04). ↑ 45.0 45.1 45.2 45.3 Livestream, 31 October 2018 (36:59). ↑ 47.0 47.1 47.2 47.3 47.4 47.5 47.6 Livestream, 6 December 2018 (28:45). ↑ 48.0 48.1 48.2 48.3 48.4 2018-12-08 Newsletter. ↑ Livestream, 6 December 2018 (33:55). ↑ 50.0 50.1 50.2 50.3 Livestream, 6 December 2018 (26:12). ↑ 54.0 54.1 Kickstarter $1,750,000 Stretch Goal Unlocked, 13 May 2017. ↑ Livestream, 17 May 2017 (5:49). ↑ Livestream, 26 May 2017 (39:34). ↑ Interview, 31 October 2018 (5:03). ↑ 61.0 61.1 61.2 Ashes of Creation - The visuals. ↑ Interview, 31 October 2018 (5:43). 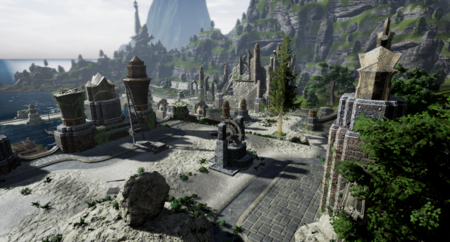 ↑ A chat with Ashes of Creation's Steven Sharif, 7 June 2017. ↑ A reactive world - Nodes. ↑ Livestream, 16 October 2017 (17:09). ↑ 69.0 69.1 69.2 Interview, 20 October 2018 (2:36:25). ↑ Video, 5 April 2018 (35:01). ↑ Livestream, 31 October 2017 (29:50). ↑ 72.0 72.1 72.2 Podcast, 23 April 2018 (29:56). ↑ Interview, 11 May 2018 (1:00:19). ↑ 76.0 76.1 76.2 76.3 Livestream, 8 April 2018 (PM) (55:49). ↑ 77.0 77.1 Livestream, 9 July 2018 (25:34). ↑ Livestream, 3 November 2018 (0:00:51). ↑ Livestream, 3 November 2018 (00:01:59). ↑ 84.0 84.1 84.2 Livestream, 26 May 2017 (51:37). ↑ 85.0 85.1 Interview, 20 April 2018 (9:20). ↑ Livestream, 17 May 2017 (44:42). ↑ Livestream, 28 July 2017 (37:25). ↑ 88.0 88.1 Video, 5 April 2018 (44:06). ↑ Podcast, 11 May 2018 (51:39).